Idwal Slabs. Photo Mikey Bean. A woman has died in a fall in Snowdonia. The incident happened this evening on the Idwal Slabs near the base of Glyder Fawr in the Ogwen Valley. Early reports suggested a member of a party, not connected with the dead woman, alerted police, saying they believed someone had fallen. A spokesman for North Wales Police said: “At 6.46pm, North Wales Police had reports that a female had possibly fallen off Idwal Slabs mountain in Snowdonia. “Police initiated a search of the area involving Ogwen Mountain Rescue Team, Search and Rescue Dogs Association, 22 Squadron, RAF Search and Rescue, and also the police. 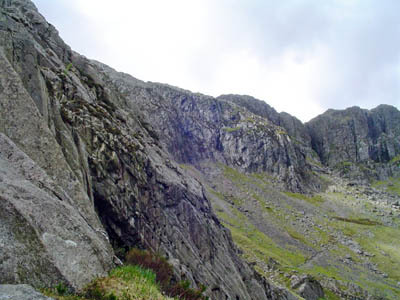 “At a quarter to nine this evening, a female body has been found at the base of Idwal Slabs.